Hyannis Port, Mass. - As billions watched in the United States and around the world, a complex operation involving dozens of U.S. Navy Seal divers and support personnel have succeeded in removing famous legal analyst, news commentator and Trump supporter Alan Dershowitz from Martha's Vineyard where he has been trapped for two weeks. 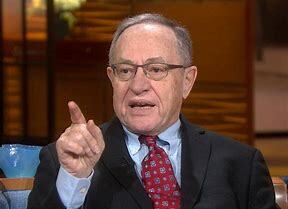 Fortunately Dershowitz, despite his desperate physical and emotional condition, was able to update the public through constant interviews and social media posts throughout the crisis. Trouble started for Dershowitz immediately after arriving on the tony island location, when he was ordered at breakfast to pay for his normally complimentary Bloody Mary at Maison Villatte. That afternoon, things went rapidly downhill for the legal analyst, as he waited for a call from a neighbor including the usual invite for afternoon tea, a call that never came. "I am clearly being targeted by the wealthy liberals who make up a significant part of the summer residents here, it’s worse than McCarthyism” said Dershowitz, updating Fox and Friends the next day of the deteriorating situation on the island. After daily discussions regarding his plight on Fox, CNN and just about every other news outlet, President Trump decided on the rescue effort, a sea based operation which had to be conducted in the middle of the night, since an exit through the airport would have dangerously harmed his frail mental and physical condition. Dershowitz was picked up on the island's far side in a specially outfitted submarine guided back to Hyannis Port by a team of the best Navy Seal divers available. "We have saved Alan Dershowitz thanks to our brave Navy Seals", tweeted Trump the next morning. "Its tragic what the Dems and liberals tried to do to Alan, very sad".